Since Trump slithered into the White House he's been bragging about what a great negotiator he is. A lot of well-meaning Americans believed him and overlooked his many faults hoping for a better future. But in less than two weeks he's already shown that he's not only horrible at negotiating, but is leading us down a dark path that may result in an economic global crisis, or worse yet, war. Trump's first attempt to set down with the leader of another country failed in dramatic fashion. After insulting Mexico's president via a tweet, all negotiations were called off. Rump's ego may have believed Mexico would pay for his wall, but no one else (with half a brain) did. 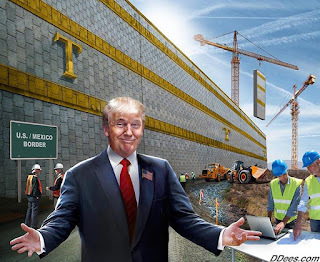 Warning the Mexican president not to visit if he wasn't prepared to pay for his wall has to go down as the worst attempt by any U.S. President to negotiate with another country. Frump is finding out he can't just bully countries like he's done to people all of his life. You'll notice that Lump didn't have a reply for Mexico's president when he said he wasn't coming. Don the Con was baffled. His response? The American taxpayer is now going to build the wall. Chump then plans on putting a 20% tariff on Mexican goods as a way of making "them" pay for the wall after all. Any national economist could tell you that would be a very bad idea. But when you have an ego like Bump's it has to be massaged. When Dump turned his attention to trying to bully China he got a curt reply - "Don't mess with us" and "there's no room for talking about changing the current policy of One China." Mind you, this verbal sparing started on twitter one morning when little Donny woke up on the wrong side of the bed. He didn't bother to talk to any of the foreign affairs experts available to him - he just stabbed his stubby little fingers on his phone and managed to piss off China's leadership. I'm not sure if China will ever want to talk with Trump the self-anointed Great Negotiator after a start like that. The same goes for numerous other countries in the world. The self-professed World Class Negotiator has managed to turn one of our longest allies - the UK - against him. Millions of people there have signed petitions asking the Queen not to host a state visit for the Orange Vulgarian. At this point it's clear that Don the Con has given America a black eye in less than two weeks. Based upon what we've seen thus far, the USA's standing with the world will be ruined after four years of Trump's brand of negotiating. That's assuming, of course, that he doesn't lead us into a nuclear holocaust first.